The architect of the project is the Portuguese Tomás Taveira, responsible for among others the stadiums of Sporting, Leiria and Aveiro, all used during the 2004 Eurocup. The new Arena will have a capacity of 45.000 people: the lower ring holds 30.000; the two mid floors with roughly 250 cabins, restaurants and space for press and other professionals have a capacity for another 5.000; and a superior ring holds another 10.000 seats. In addition, the Arena will sport four new and modern dressing rooms, completely adapted to FIFA standards. The construction is scheduled for completion by the end of 2012 (well ahead of the World Cup 2014, hosted by Brazil) with state of the art technology and moulded within the concept of sustainability, particularly in regard to the use of energy and the recycling of water. The Arena, budgeted at R$300 million (roughly €135 million) will however not be used exclusively for football: it will also be an important centre for cultural, musical and sports events in general. The localisation of the Arena is key in this aspect; closeness to the São Paulo city centre and several main avenues provide ease of access in the biggest city in South America and the economic centre of Brazil. For these kind of events, the spectator capacity could be expanded with an additional 15.000, holding up to 60.000 people. Palmeiras will not need to chip in with any of the budgeted €135 million, as the project is entirely financed through a conglomerate of private investors, led by the constructor WTorre. WTorre will also cover all expenses for the running of the Arena (energy, water, security, cleaning, insurance, pitch care, etc – estimated at about €4 million yearly) for 30 years. The revenues from home games will be 100% destined to Palmeiras. 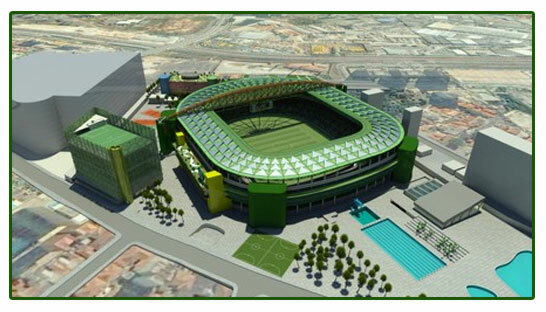 In addition, Palmeiras will have a cut in the revenues from other activities carried out on the Arena. This cut – today at 5%-20% depending on the type of revenue – will increase by 5% every five years. Thus, the Arena will provide Palmeiras with a new and secure revenue in a magnitude never before seen. Check out the brilliant video presenting the Arena project here!